Ahead of the BRICS summit in Goa, the Congress has expressed its objection to the logo of the event, which it said looks like the party symbol of the Bharatiya Janata Party even as the Aam Aadmi Party questioned the absence of the name of the place, where the meet is being held, from the logo. “It is highly improper on the part of the relevant BRICS Committee to select the election symbol of a member country, India, when it is well-known that lotus is BJP’s poll symbol. Elections of the Goa assembly are due to be held in February 2017. In Uttar Pradesh, Uttarakhand, Punjab and Manipur also polls are due,” Congress MP Shantaram Naik said. The Congress leader also filed a petition in the Election Commission of India demanding that steps should be taken to “freeze” BJP’s election symbol, as the party has “misused” it by going against the spirit of Symbols Order, 1968, the law which regulates the allotment of symbol. Meanwhile, AAP spokesman Rupesh Shinkre sought to know why the name of Goa is not mentioned in the logo, whereas in the past BRICS events, the logo carried the names of the host places. 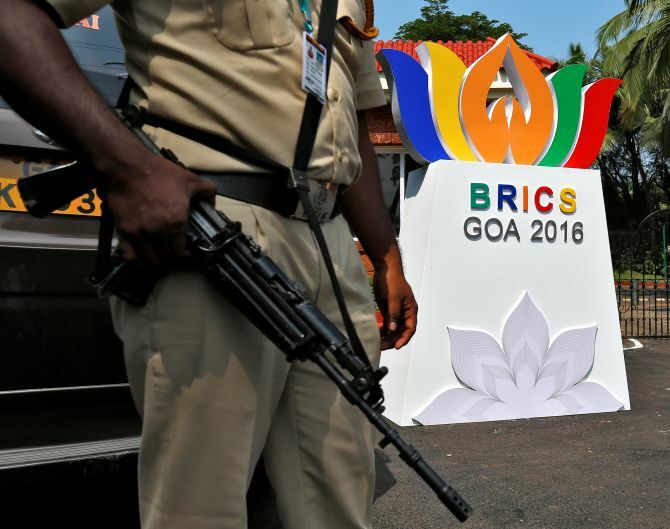 “As India is gearing up to host the 8th BRICS Summit, it is a matter of pride to Goa to host the event, where the leaders of the next world powers would set their foot,” Shinkre said. “Goa has been earlier a venue to such world events. But BRICS is the biggest among them. Venues of such meets are very significant because the declarations are named after the place of its convention. The 8th BRICS Declaration would be a called as the Goa Declaration,” he said. “With all the humility we would like to draw the attention of stakeholders to issue which has been neglected. The logo of a summit should incorporate the name of the place. Like BRICS summits held in the past since 2009. That is Yekaterinburg (Russia) in 2009, Brasilia (Brazil) in 2010, Sanya (China) in 2011, New Delhi (India) in 2012, Durban (South Africa) in 2013, Fortaleza (Brazil) in 2014 and Ufa (Russia) in 2015. But the BRICS 2016 logo doesn’t find the mention of Goa. This is strong exception to the precedence,” he added. The BRICS Summit will take place in Goa on October 15 and 16.